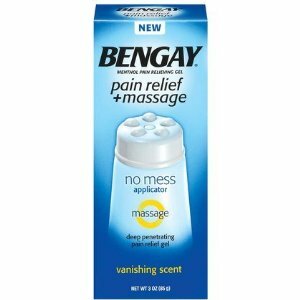 Massage Plus Pain Relief: Oh Yeah. I’m a little crazy (not that this is a surprise). See, I like soreness. Not the kind of soreness where you can’t walk or sit down without grunting in agony, but a little soreness here and there lets you know you did something new and that you pushed it. Problem is, sometimes when I work out, I don’t just kind of work hard trying something new. I give it my 110 percent…which equates to crazy soreness. (Mostly I blame/credit this place.) And when this happens, I hobble around like a gram-mama for two days, attempting some yoga to loosen up and begging my husband to rub the affected spot(s) o’ soreness (really trying to not make that sound overtly dirty). But sometimes yoga doesn’t do it, and occasionally my husband gives me that look that says, “Really, am I just here to serve you?” At which point I say, “yes,” and he ignores me. Oh I want this on my knees…right now. She Runs LA…10K. Oh yeah!